It’s been a rough few weeks for unionized workers in Canada. Montreal police tear-gassed workers picketing outside newly-bankrupt aircraft maintenance firm Aveos. Mass layoffs at printing company Transcontinental wiped out 500 jobs in Montreal and Dartmouth, NS. The House of Commons denied Air Canada workers the right to strike. But Concordia’s unionized workers say they’ve had more than a few rough weeks. “Whether you’re formally at the table or not, one never stops negotiating around this joint,” said Maria Peluso, president of the Concordia University Part-Time Faculty Association. She was chief negotiator for CUPFA during a record-setting seven-year period of negotiations that finally ended in 2008 after the union began rotating strikes. “Concordia has a reputation of delaying negotiations, protracting negotiations, seemingly forever. It’s extremely unprofessional,” said Peluso. Bob Sonin, president of the Graduate Students’ Association and VP Bargaining for the Teaching and Research Assistants of Concordia, agreed. “We have the distinction of having the largest period of negotiations,” Peluso noted wryly. But many other unions have similar stories. Almost three years after their collective agreement expired, the Concordia University Library Employees Union is still negotiating with the university. CULEU deposited their demands in January 2010, but negotiations have been moving slowly since then, explained union president Irene Fernandez. “We’d like to do this in six months, a year, max. And we said that when we made the deposit. We said it the last time we negotiated. This institution just isn’t moving,” she said. Concordia’s 96 maintenance workers are in a similar situation. Represented by the United Steelworkers Local 9538, they have been embroiled in an acrimonious and much-publicized dispute with the university for years. Workers at the downtown campus have been without a collective agreement since June 2008, and their colleagues at Loyola haven’t had one since June 2009. “We’ve been at it since 2009, and [Concordia] couldn’t care less,” said Eddie Ginocchi, vice-president of the USW Local 9538. Ginocchi said his members are underpaid and need more staff to keep up with an increasing workload, but the university has so far refused to consider the union’s demands. 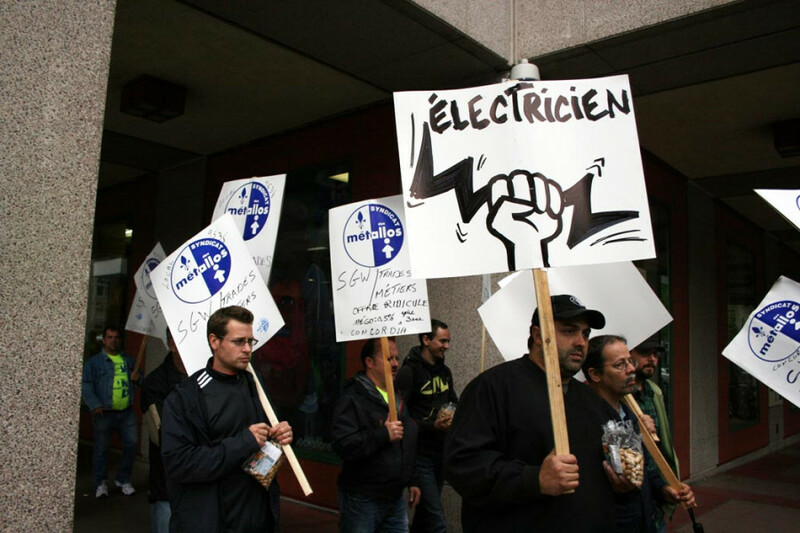 “We haven’t ever seen such long negotiations,” said USW Quebec spokesperson Clairandrée Cauchy. The Concordia University Faculty Association’s current collective agreement won’t run out until this May. But their last agreement took two years to negotiate, and they’re already predicting that this round, which began in November 2011, could be just as lengthy. Willsher referred The Link to Concordia’s website and Frequently Asked Questions section for more information. Further interview requests were directed to the university’s media relations, but were not returned by press time. Unless any major breakthroughs are made, all but two of Concordia’s unions will be negotiating with the university by this August. This backlog won’t speed up the already-slow bargaining process, said Sonin. It’s not an encouraging sign for unions like TRAC who have yet to begin their negotiations. Fernandez noted that her colleagues in the Concordia University Professional Employees Union had even considered holding off negotiations because of the backlog. To avoid delaying their negotiations, CUFA offered to set aside all non-monetary demands. Their previous collective agreement wasn’t “all that bad” according to Rakita, so the union was prepared to leave it as-is. “Change for the sake of change” was the university’s response when asked why these issues were only being raised now, Rakita said. Other unions noted that such long negotiations meant that they often had to restart discussions or go over the same issues again. “We saw four different university presidents, three different directors of human resources,” said Peluso. And the university’s negotiators also keep changing, according to several union reps.
“There’s always new people, so most people find themselves training the very people they’re negotiating with,” Peluso said. CULEU is also dealing with a new negotiator and there’s been a significant learning curve. “Someone who has just come in will not know the culture and how things are done here,” said Fernandez. “The money is the main demand,” Ginocchi explained. “The university has the same old story: there is no money and we can’t pay […] Yet we see plenty of money being thrown out the window,” he said, referencing the millions of dollars Concordia has spent on severance packages for departing senior administrators in recent years. He also noted that in 2010 the university gave a 2.5 per cent raise to senior administrators, whose average salary—not including benefits—is almost $200,000. The university hasn’t been so generous with the unions, Ginocchi said. CULEU has asked for a two per cent wage increase, plus cost-of-living adjustments. “Things have gone up tremendously cost-wise, from bus fares to gas to whatever, and our salaries have not gone up in the past three years at all,” explained Fernandez. It’s been five years since the Steelworkers had a raise, and the university hasn’t budged on salaries during the current negotiations, Ginocchi said. In the meantime, the university campus has grown hugely, and his members can’t keep up with the work. Hiring more maintenance workers would help, but it’s difficult to find people because qualified workers can usually earn more elsewhere. A unionized electrician making $23 per hour at Concordia would be paid about $34 per hour for the same job at Bombardier, Ginocchi said. The university has so far refused to compare the Steelworkers’ wages to their colleagues’ wages at other universities. “When McGill’s tradespeople got a certain amount, [admin] told us, ‘Well, they’re gonna go broke, because they cannot afford to pay that much,’” Ginocchi recalled. Shortly before the Steelworkers left the table after years of unproductive bargaining, the workers’ representative “used colourful language toward the spokesperson at the university,” Ginocchi remembered. Many other union reps stressed the need for a more conciliatory, less adversarial approach to negotiations. CULEU tried interest-based bargaining—which encourages parties to present broad interests, rather than demands, in order to find a win-win solution—but quit in November 2011 after the provincially-appointed conciliator decided the sessions weren’t going anywhere. “You can’t negotiate on interest-based bargaining and have Joseph Stalin across the table,” said one union representative. The tone in the Steelworkers’ negotiations has been similarly difficult, according to Ginocchi. Many union representatives claimed that the less-than-amicable tone and slow pace of negotiations have pushed them to consider other options, including striking. The Steelworkers were supposed to meet with the university on March 30, but that meeting has since been pushed back to April 17. Ginocchi expressed hope that they will make some progress at the next meeting, but the union still has a strike mandate and could stop work if things don’t go well. “We have to make a decision—either we go ahead or we blow up again,” he said, alluding to his union’s one-day strike in September 2011. It took rotating strikes to break the stalemate in CUPFA’s seven-year-long negotiations. An agreement was finally signed, but the bitter dispute didn’t help employee-employer relations. “It simply cemented our resolve, that’s one thing that it did, which I don’t think is very productive,” said Peluso. “Negotiations lasting over two years are definitely the exception in Canada, not the rule. And we don’t want to follow that tradition,” explained Rakita. At other universities, he noted, some faculty associations take a strike vote before negotiations begin, in case discussions drag for too long. CULEU is facing similar problems. But after almost three years, it’s becoming increasingly difficult. “A collective agreement should be implemented. It’s not a contract that’s either/or, but a contract of mutual agreement. There should be harmony. That’s not the case with any of them,” said Peluso. Ideally, she said, a collective agreement should be positive. “Certainly we feel that the salary and benefits that we pay to all of our employees are fair and comparable to other universities and similar institutions,” Concordia’s VP institutional Relations Bram Freedman told The Link in November. But the issue isn’t specific demands, Peluso explained. “It’s not, ‘Okay, what is it the library workers want, and what do the maintenance workers want, and what do I want?’ I can give you a list—we can all give you a list—but there’s something fundamentally wrong with how Concordia handles labour relations. “An employer should be validating their employees. There are great people at Concordia. Great secretaries, labour workers, teachers, maintenance workers, professionals, managers.